A Shepherd found a Wolf's Cub straying in the pastures, and took him home and reared him along with his dogs. When the Cub grew to his full size, if ever a wolf stole a sheep from the flock, he used to join the dogs in hunting him down. It sometimes happened that the dogs failed to come up with the thief, and, abandoning the pursuit, returned home. 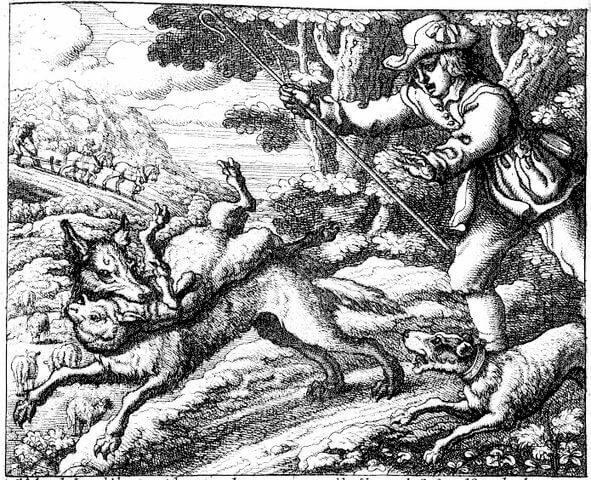 The Wolf would on such occasions continue the chase by himself, and when he overtook the culprit, would stop and share the feast with him, and then return to the Shepherd. But if some time passed without a sheep being carried off by the wolves, he would steal one himself and share his plunder with the dogs. The Shepherd's suspicions were aroused, and one day he caught him in the act; and, fastening a rope round his neck, hung him on the nearest tree. Add The Shepherd and the Wolf to your own personal library.